Today sees the publication of Crisis Without End? 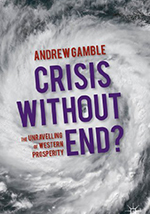 : The Unravelling of Western Prosperity by Professor Andrew Gamble. The work is a major reassessment of the 2008 financial crash – showing that it was no ordinary crisis, but the harbinger of a much deeper convulsion comparable to past crises of capitalism. Andrew Gamble looks to the future at a world where the old western international order has been weakened and the path to a new era of prosperity depends on a political will, so far notable by its absence at all levels, without which there is little prospect of escape from a future of crisis without end.